CNN Philippines certainly is making more changes in its programming lineup. Following the revamp of daily programs such as New Day and Global Newsroom, and the launch of its new evening newscast News Night with Pia Hontiveros, the local CNN station has quietly cancelled two of its native-language newscasts. Cebuano News and Kapampangan News were dropped from the network's afternoon block earlier this month to make room for the simulcast of CNN International programs. The said cancellation, we were informed, had been planned months in advance. Anchors of the newscasts, Jun Tariman and Nicolette Henson-Hizon, will remain part CNN Philippines, with the former keeping his post as the head of regional news operations and the latter as news bulletin anchor and regular correspondent. Cebuano News made its debut in 2013 back when Channel 9 was still known as Solar News Channel. It was originally anchored by Menchu Macapagal before Tariman — the newscast's executive producer — took over about a year ago. 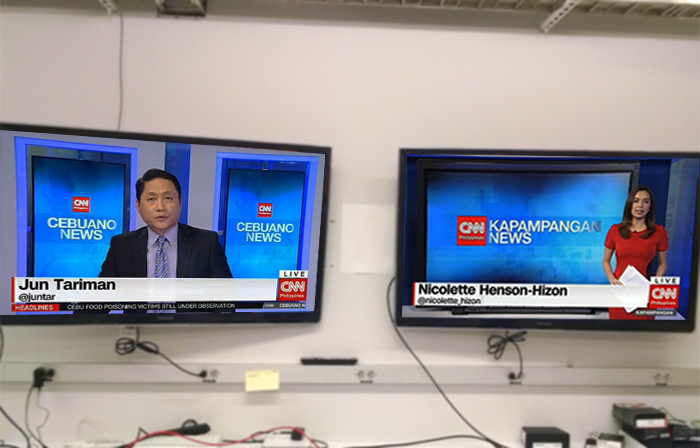 Kapampangan News, meanwhile, was added to the network's lineup in 2014 as a news vehicle for then-newly discovered talent Henson-Hizon.